Some places call for adventure—abseiling in Blue Mountains National Park, a safari in Sub-Saharan Africa—but other places are better suited for a different kind of sensory stimulus: serene relaxation. 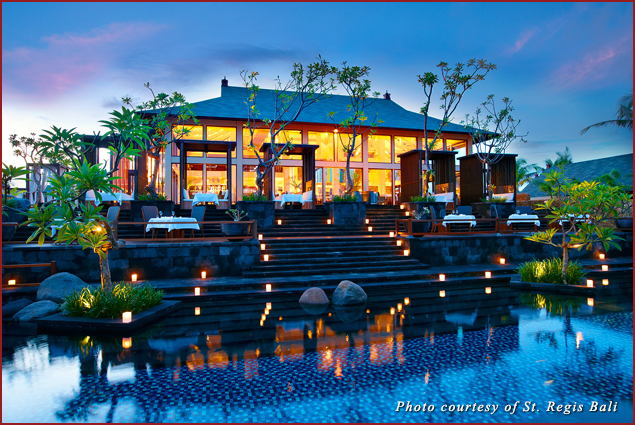 This is exactly why I recently landed at the St. Regis Bali. 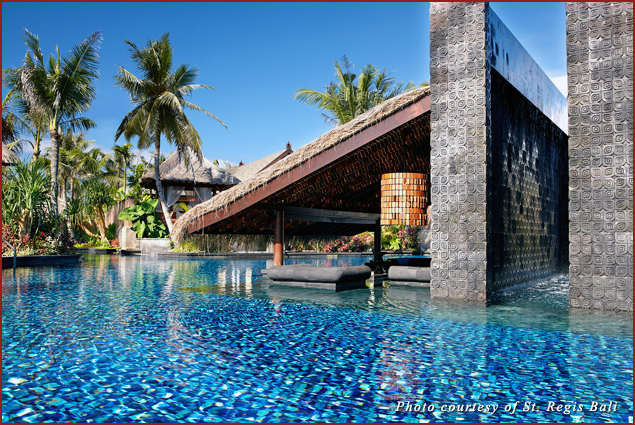 Inside the gated five-star community of Nusa Dua, there is no shame in indulgence or apology for leisure. I didn’t try to make a humble experience of my stay at this multi-million-dollar resort, though the warmhearted staff almost had me believing I could. 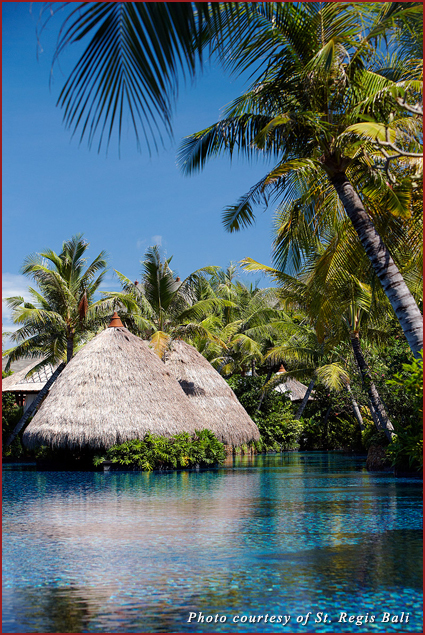 The 80 generously-sized suites and 42 private villas of this resort that opened in 2008 line a strip of white sand along the azure coast. 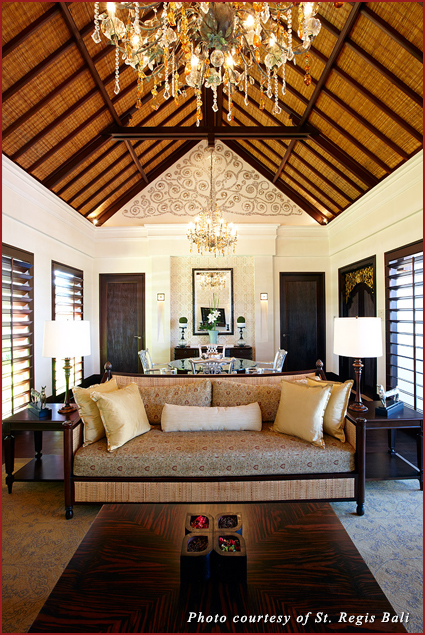 The design offers a modern take on traditional Bali, with antique-like furniture in each room. Lamps in the oversized bathroom resemble the roof of a Balinese Hindu temple. Black stone sculptures populate the grounds and a lava sand pond dotted with over a hundred tiki torches represents a volcanic river flowing into the sea, a common scene in nearby villages. 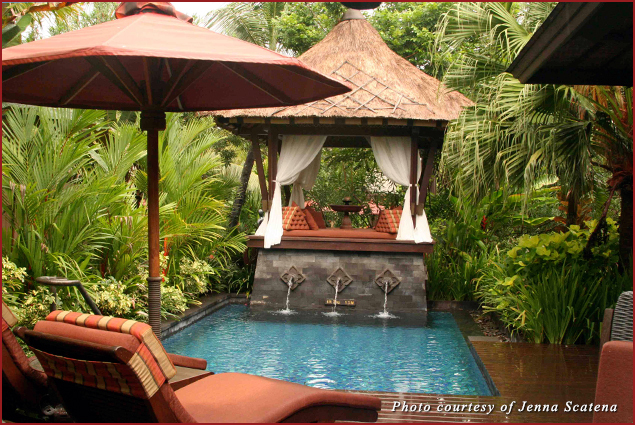 The resort’s Remède Spa is set in a serene corner of the resort, surrounded by a koi pond. The 12 private treatment rooms offer a combination of traditional and unique treatments. But for the adventurous and culinary curious their epicurean-inspired spa menu offers treatments like the “Bloody Mary Ritual,” inspired by the St. Regis’ signature drink. This incorporates pineapple, wasabi, and a vodka-tomato clay wrap, finished with a vermouth and mineral salt bath. 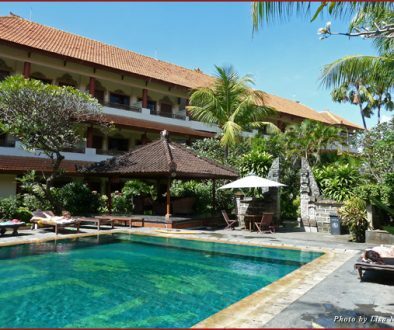 The Coffee Treatment consists of rubbing a warm coffee pad over the spine for detoxification, and the Sunda Islands Sun Facial uses grape and green tea extracts to repair skin damage. 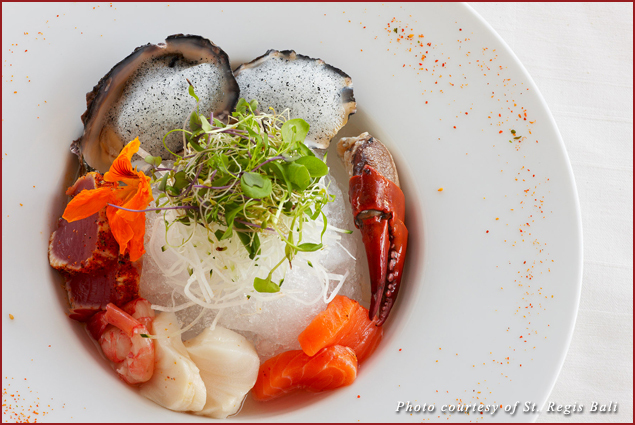 For those who prefer to keep their relationship with food on a purely consumption-based level, Kayuputi offers a contemporary menu that could fit comfortably at a swanky Manhattan joint. My night started with an amuse-bouche of fresh tuna tartar and aubergine caviar atop a single layer of potato, followed by an appetizer of paper-thin slices of Wagyu beef carpaccio splayed across a smear of ricotta and sprinkled with a yuzu wasabi crumble and fresh coriander. Rifts of sizzles, splats, and clanks echo from the open kitchen, where the half-dozen chefs are diligently working away. Next a barramundi (Indonesian sea bass) fillet, fresh from the neighboring mangrove estuary, appears with a browned lemon butter and a méli-mélo of organic veggies. Dessert is offered by flavor. Banana: banana bread with chantilly coffee cream… caramelized banana… spiced banana ice cream. Or, as another example, pineapple: pineapple with coconut tulle… piña colada espuma… You get the idea. Sommelier Harald Wiesmann has constructed one of the most notable wine lists on the island, minted with two Wine Spectator awards for one of the world’s best wine lists, bearing heavy on the Australian and French selections. 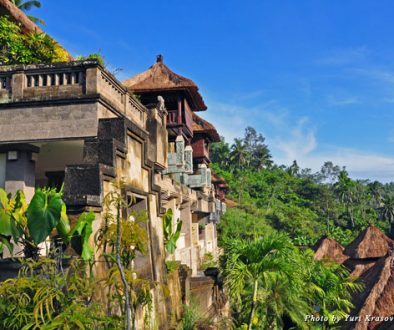 (Be aware that Bali has an unfortunately high tax of about 15 percent on all imported alcohol). 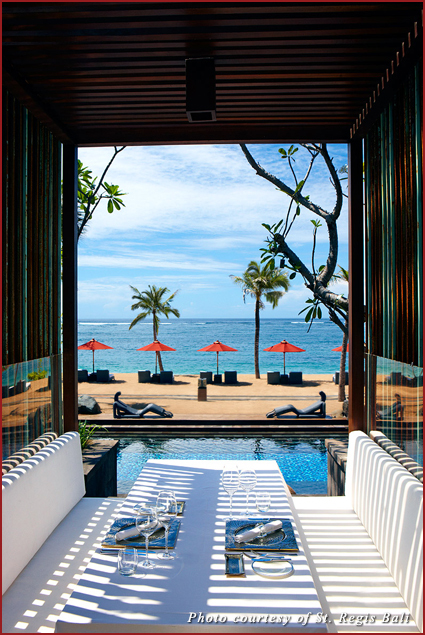 The decor is elegant modern with an unobstructed ocean view, and alfresco seaside dining. The interior is very neutral; the name, Kayuputi, means “white wood,” and that’s certainly reflected in the exposed blonde beams, tables, and chairs. This, along with the fresh seafood offerings, almost makes it feel like you could be in a beach house at Martha’s Vineyard. Be aware that the wet season is December through February, and monsoons can roll in on a daily basis. Not the best weather for taking advantage of their beach or lagoon pool. My other advice if you’re heading this way? Don’t be modest–go for one of the villas. 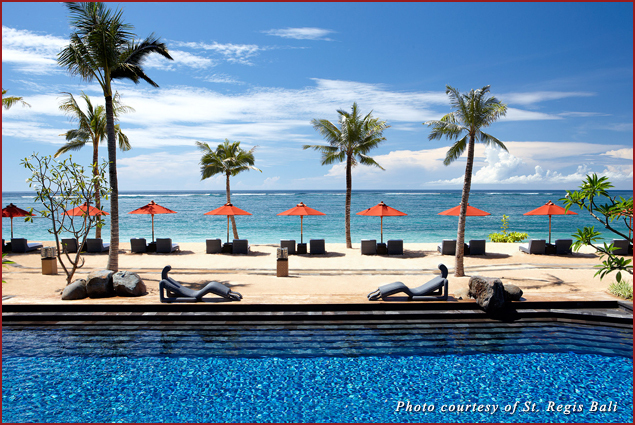 Details: The St Regis Bali is a 20-minute cab ride from the Denpasar Airport at Kawasan Pariwisata, Nusa Dua, Lot S6, Nusa Dua, Bali; 1-877-787-3447.